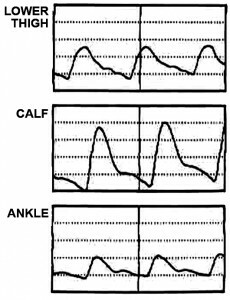 Vascular Doppler studies can be very helpful in the treatment of peripheral artery disease and vascular disease. Vascular Doppler can be compared to diagnostic ultrasound, or sonar, for the blood vessels. The Vascular Doppler probe has a special crystal within it that is used for sending the ultrasound waves into the tissue, and a “receive” crystal is used to “collect” the returning ultrasound waves as they “bounce” off the blood cells. The probe can also sense frequency differences in blood flow. These are heard as an increasing frequency change whether the blood is flowing toward or away from the probe. Dopplers are available that apply this principle of high and low pitch sound with flow to and away from the transducer to obtain direction. The system compares the reflected echoes with the transmitted echoes, and then analyzes the waves, and amplifies them to produce the audible signal heard from the speaker. If the blood is not moving, or the ultrasound path is not on the vessel of interest, no Doppler sound will be heard. 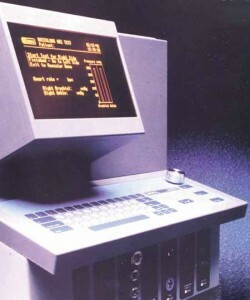 Computerization of the data collected, and evaluation of the intensity of signal returned, allows for a graph to be generated that provides information about blood flow volume. The Noninvasive Vascular Laboratory (the “Blood flow lab”) allows patients to be examined using Doppler ultrasound techniques free of the risks and discomforts of injections and/or other invasive maneuvers. These tests allow diagnosis of almost all known or suspected vascular disorders, and testing can often determine the severity of the problems and the need for treatment. Despite the fact that atherosclerotic PAD is a risk factor for premature death, it is vastly under-diagnosed. Estimates of its prevalence depend on which definition of PAD is used. If PAD is identified on the basis of an ankle-brachial index (ABI) of less than 0.90, its prevalence is as high as 29 percent among patients in primary care practices. Diagnosis can be complicated when mixed disease (both vascular and neurogenic sources of pain) is present. In these patients the vascular Doppler exam helps determine what portion, if any, of the symptoms are vascular in character. Exercise (stress exams) are particularly useful in these patients, and in those with early vascular disease. Even when claudication is minimal, its presence can be a major reason why other structures involved don’t heal or continue to create pain. Fortunately, once recognized, vascular disease is treatable with lifestyle changes (no smoking and a healthy diet), medication, and exercise. Physical therapy, gait analysis to reduce energy of ambulation, and sympathetic nerve blocks can be used to relieve pain and improve circulation as well. Like most disease, the earlier PAD is detected, the better the outcome. When neurogenic disease is present, treating the PAD component can yield surprisingly dramatic relief. We are proud to offer state of the art ultrasound for patients in Greenville, Spartanburg, Anderson and surrounding areas.